New Island Essence Organics Products! We received a new shipment of lotions, shampoos and conditioners, and body oil from the Island Essence Organics Company. These are produced and shipped directly from Maui, and the last order we displayed was very popular. 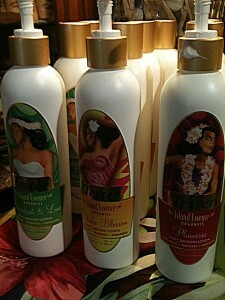 The fragrances come in either Plumeria, Pikake, or Passionfruit Lime, and the body oil is derived from kukui nuts. The lotions in particular are very silky and long lasting once applied, and many of our customers will welcome the return of the kukui nut oil!